I s’pose much of gardening is experimentation, though some experiments are more forthrightly whistling in the dark than others. I’ve never had a cold frame before, though I know people who religiously seed things into frames made from old windows, winter salads being a favorite. So, this year, re-infused with enthusiasm by a new greenhouse, I decided to try growing herbs in there with nothing more than a heat mat and row cover at night – eventually very mildly aided by a half-filled barrel of water. I had also started some arugula since several of my more favorite salads call for it – roasted beets with goat cheese and toasted walnuts and balsamic dressing on arugula, for one, warm roasted butternut squash, French lentils and scallions on arugula for another. Each benefits from that the peppery bite of arugula, so different from lettuce, but finding fresh arugula in a grocery store here on the upper Eastern Shore in winter is almost impossible. So, when I started the herbs, I also seeded some of Renee’s rustic arugula in a flat. It came up, got repotted, and survived a fair amount of neglect as I hovered over the parsley and cilantro (and lime basil that didn’t make it). But by early February, it was getting spare looking, definitely needing a way to go forward in its growth. 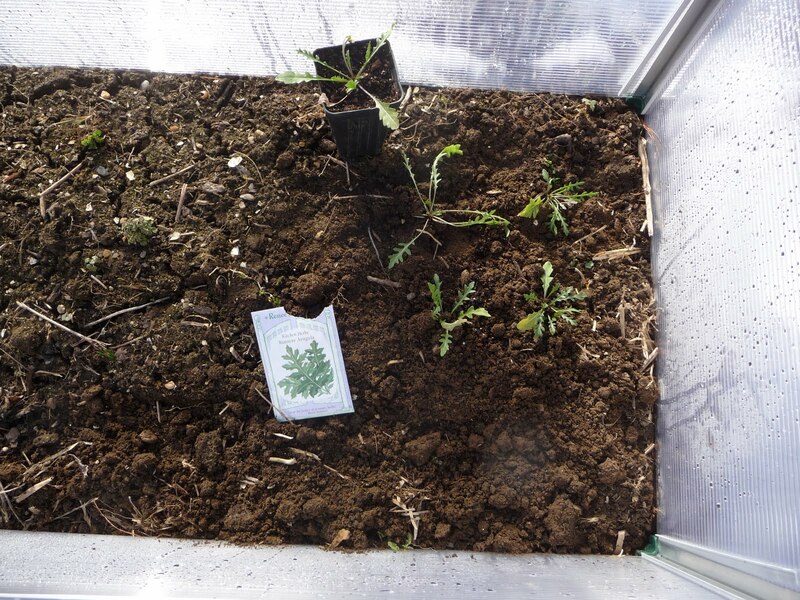 Last Friday, when it was 70 blessed degrees, I went out and finally put together a cheaply made plastic cold frame that had been sitting in a box in my shed for nearly two years. Turned out the box was full of marmorated stink bugs, who, I was fascinated to observe, play possum when they sense that you are killing their brethren. Then, when they think you’ve ceased and desisted, they start moving again. I watched this happen probably ten times during the course of constructing the cold frame, so it’s not my imagination. I eventually managed to get them all. I hope. Once the frame was put together, I plopped it down on a bed on which I had spread compost last fall, and shoved in the few repotted arugula plants. I closed the lid and forgot it for a couple of days. Snow fell– four inches or so – on Monday night and when I went out to check the fairly flimsy cold frame, I expected to find it collapsed and the arugula frozen to death. But lo and behold, it had held. I scraped off the snow, but found the plants looking decidedly peaky. I figured they wouldn’t make it, though I left them. just in case. Today, two days later, they had recouped. Definitely. The ground, as determined by the finger test, seemed warm enough, so I planted them. Then for good measure and another experiment, I seeded a little row of arugula in beside them. We’ll see. Despite the snow and cold, the bowed heads of the dafs in the shelter of my back step are once again standing up. The cardinals and robins are larking in the trees, and the lilac buds are starting to swell. Perhaps I’ll even have arugula salad before too long. And if not, maybe I’ll have learned something.